There is something about this video. I keep coming back to it. The music selection is what really cements it for me. 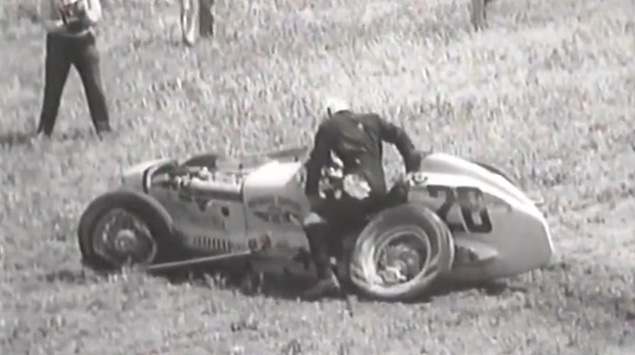 It is a fantastic collection of vintage auto racing crashes. Be warned, however, that it is difficult to watch. Some of the crashes shown were almost certainly fatal. This compilation has been set to A.A. Bondy’s great tune, “Killed Myself When I Was Young”. The song, with its low, steady, dark tone, really brings both the romance and the reality of vintage auto racing to life. One thing that stands out to me in this video is how beautiful these old race cars are. From the open wheeled Indy cars to vintage grand prix cars, they have such style, such character. Alas, most of those in this video were wrecked, and became a somber illustration of how dangerous racing once was. Need That Car salutes auto racers of days gone by. This entry was posted in 1930s, 1940s, 1950s, Items of Interest (Not for sale), Race cars, Sweet videos, Vintage Midgets. Bookmark the permalink.